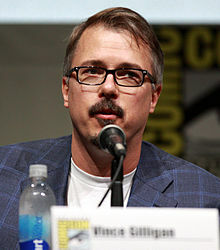 George Vincent "Vince" Gilligan, Jr. (born February 10, 1967) is an American writer, producer, and director. He is known for his television work, specifically as creator, head writer, executive producer, and a director of Breaking Bad and its spin-off Better Call Saul. He was a writer and producer for The X-Files and was the co-creator of its spin-off The Lone Gunmen. Both Breaking Bad and Better Call Saul have received widespread critical acclaim, with Gilligan winning two Primetime Emmy Awards, six Writers Guild of America Awards, two Critics' Choice Television Awards and Producers Guild of America Awards, one Directors Guild of America Award and a BAFTA. Outside of television, he co-wrote the screenplay for the 2008 film Hancock. Gilligan was born in Richmond, Virginia, the son of Gail, a grade school teacher, and George Vincent Gilligan, Sr., an insurance claims adjuster. His parents divorced in 1974 and he and his younger brother, Patrick, were raised in Farmville and Chesterfield County, and attended the laboratory school run by Longwood College. Growing up, Gilligan became best friends with future film editor and film title designer Angus Wall. His interest in film began when Wall's mother, Jackie, who also taught alongside Gilligan's mother, would lend her Super 8 film cameras to him. He used the camera to make science fiction films with Patrick. One of his first films was entitled Space Wreck, starring his brother in the lead role. One year later, he won first prize for his age group in a film competition at the University of Virginia.